Winter is almost over, let’s celebrate it with those funny liver snacks rolled in bacon… You know what, we think just the snacks is not enough! Ciabatta, fried onion, portion of savory special spice mix and some Japanese seaweed chips – Nori! Of course, we also want to use snow while we still have it here and some balsamico will finish the job. Yap… and now we celebrate incoming spring! Roll chicken livers into bacon. Skewer up. Preheat the pan, grease it with oil. Fry rolled livers and onions until first golden-brown marks. Add 1tbsp. of butter, 1tsp. 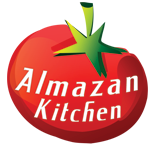 of Almazan spice mix, balsamico to taste and snow. Slow-cook for 10-15 min. Build the sandwich: bottom ciabatta, livers in bacon, handful of nori, chopped green onions, top ciabatta half.